Almost all tools have parameters and you set their values on the tool dialog box or within a script. When the tool is executed, the parameter values are sent to your tool's source code. Your tool reads these values and proceeds with its work. To learn more about parameters, see Understanding script tool parameters. In a Python toolbox (.pyt), tool parameters are defined in a tool class' getParameterInfo method by creating Parameter objects and setting their properties. The parameter name as displayed on the tool's dialog box. The parameter name as shown in the tool's syntax in Python. Every Python toolbox tool parameter has an associated data type. When the script tool dialog box is opened, geoprocessing uses the data type to check the parameter value. For a list of parameter data types, see Defining parameter data types in Python toolboxes. Required—The tool cannot be executed until a value has been supplied. Optional—The parameter does not require a value. Derived—The parameter is only for output parameters (see direction below). A derived output parameter does not show on the tool dialog box. This property defines whether the parameter is an input to the tool or an output of the tool. If parameterType is set to Derived, then the parameter direction should be set to Output. The example below defines three parameters for a tool: an input parameter that accepts a feature layer, an input parameter that accepts a new field name, and a derived output parameter based on the first input parameter. For the parameters to be reflected in the tool, return the parameters at the end of the getParameterInfo method. The output is the same as the input, such as Calculate Field or the example shown above. Calculate Field changes the values of a particular field on the input table—it doesn't create a new table or modify the schema of the input. Other tools whose output is the same as the input can be found in the Editing toolbox. The tool modifies the schema of the input, such as Add Field. Add Field adds a field to the input table—it doesn't create a new output table. The tool creates output using information in other parameters, such as the Create Feature Class tool. With the Create Feature Class tool, you specify the workspace and the name of the new feature class, and the feature class is created for you. The tool outputs a scalar value as opposed to a dataset. Get Count, for example, outputs a long (the number of records). Whenever a tool outputs a scalar value, the output is Derived. The tool will create data in a known location. For example, you may have a script that updates an existing table in a known workspace. The user doesn't need to provide this table in the dialog box or in scripting. If you want a parameter to be able to handle a list of values, rather than just one value, set the multiValue property to True. An example of a multivalue control is illustrated below. Some parameters, called Value Tables, allow you to specify multiple entries. For example, you can include multiple datasets for the Input Features parameter in the Append, Union, and a number of other tools, or you can include multiple fields for the Statistics Field(s) parameter in the Dissolve and Summary Statistics tools. Value table parameters are defined by setting the datatype to GPValueTable and setting a columns property to define the data types and column headings of the parameter. In the example below, a value table parameter is defined with two columns that accept field names and string values for Statistic Type (GPString). By using a ValueList filter and a list of values, a drop-down list can be generated under the corresponding GPValueTable column. To set default values for a value table parameter, use the values property and provide the parameter values in a list of lists of values. Default values can be set for a parameter by either applying a value directly with the value property or by applying the value of an environment setting using defaultEnvironmentName. The default value will be the contents of the parameter when the script's tool dialog box is opened. It is also the value that will be used if a # is entered for the parameter in scripting. If you don't specify value, the parameter value will be blank when the script's dialog box is opened. 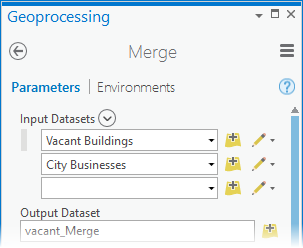 You can set the default value for a parameter to the value of an environment setting by setting the defaultEnvironmentName property to the name of an environment setting. Once you choose an environment setting, the value property will be ignored. Every output parameter of type feature class, table, raster, or workspace has a schema object. Only output feature classes, tables, rasters, and workspaces have a schema—other types do not. The schema object is created for you by geoprocessing. You access this schema through the parameter object and set the rules for describing the output of your tool. After you set the schema rules, the geoprocessing internal validation code examines the rules you set and updates the description of the output. When the input parameter datatype is a Feature Set or Record Set, you must specify the fieldsRule and geometryType of the features to be entered. The Feature and Record Set data types allow interactive input of data. Feature Set allows the user of your script to interactively create features in ArcMap by clicking on the map. Record Set allows your user to interactively create rows in a simple table grid. The symbology and schema (attributes and geometry type) can be set for the Feature Set and Record Set control by setting the parameter's value property to a feature class, table, or layer file (.lyrx). Applying a filter to a parameter allows you to narrow the choices available to the user for a parameter. For example, you can set up a field filter that limits choices to just text fields. If you want only certain values or dataset types to be entered for a parameter, you can specify a filter. Set the filter type to the appropriate value. There are six types of filters, and the type of filter you can choose depends on the data type of the parameter. A list of string or numeric values. Used with String, Long, Double, and Boolean parameter data types. A list of allowable feature class types: Point, Multipoint, Polyline, Polygon, MultiPatch, Annotation, and Dimension. More than one value can be supplied to the filter. A list of file suffixes, for example, ['zip', 'xml']. A list of allowable field types: Short, Long, Single, Double, Text, Date, OID, Geometry, Blob, Raster, GUID, GlobalID, and XML. More than one value can be supplied to the filter. A list of allowable workspace types: File System, Local Database, or Remote Database. More than one value can be supplied. Usually, there is only one filter type you can choose. Only Long and Doubles have two choices: Value List and Range. The Value List filter is very useful for providing a set of keywords. Many tools have a predefined set of keywords, such as the Field Type parameter found in Add Field or the Join Attributes parameter of many of the tools in the Overlay toolset. A Value List filter can be used for Long and Double data types. For these types, you enter the allowable numeric values. If you want the user to be able to choose more than one of the values, set the multiValue property to True. A Value List can be used for Boolean data types. For Boolean data types, the Value List contains two values: true and false. The true value is always the first value in the list. The values specified in the Value list are used in Python for specifying the value. See, for example, Add Field and the NULLABLE and NON_NULLABLE keywords used for the Field IsNullable parameter. For this filter, choose one or more filter values. Input feature classes will be checked against the filter values. So, for example, if you select only Point as the filter value, the user can only enter point feature classes as the parameter value. The file filter contains a list of file suffixes that a file may have, such as txt (simple text file) and csv (comma-separated values). You can supply any text for a suffix—it doesn't have to be a suffix that ArcGIS recognizes. The suffix can be of any length and does not include the dot. The field filter defines the permissible field types: Short, Long, Float, Single, Double, Text, Date, OID, Geometry, Blob, Raster, GUID, GlobalID, and XML. More than one value can be supplied to the filter. For a derived output parameter, parameterDependencies is set to the input parameter that will be modified by the tool. For input parameters, parameterDependencies contains the name of other parameters used by the data type. You can only set parameterDependencies for certain input parameters, as shown in the table below. If the output of your tool is a feature set, raster, TIN, or Network Analyst layer, you can specify the location of a layer file (.lyrx) with the symbology property. When your tool is run, the output is added to the display and drawn using the symbology defined in the symbology layer file. #  .pyt and .lyr files exist in the same folder). The layer file is read each time the tool is run. If the layer file cannot be found (because it was moved or deleted), default symbology will be used. Parameters can be grouped into different categories to minimize the size of the tool dialog box or to group related parameters that will be infrequently used. Parameters that set category to the same string value will be grouped together. 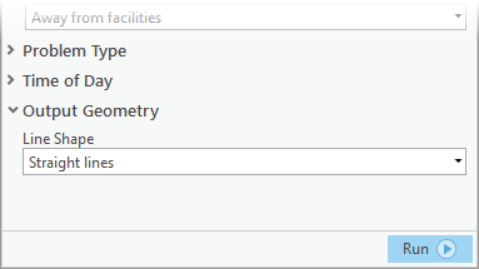 Several ArcGIS Network Analyst extension tools use categories, as shown below. Categories are always shown after noncategorized parameters. Do not put required parameters into categories, as they are hidden from view on the tool dialog box.